Infants up to 12 months old should receive at least 5 micrograms of vitamin D each day, according to the Office of Dietary Supplements. Proper consumption of vitamin D helps ensure normal bone growth in infants during development. Certain infants, especially those who are exclusively breastfed, may be at risk of developing a vitamin D deficiency. Infants who exhibit vitamin D deficiency symptoms should be evaluated by a medical professional as soon as possible. If you are a parent or expectant mother, talk with your doctor about how you can supplement your infant's vitamin D intake. The small bones of the skull are not completely formed or joined together when an infant is in utero. This flexible, soft skull allows an infant to pass through the birth canal. In healthy infants, the skull bones join together and solidify within the first 19 months of an infant's life, MedlinePlus reports. Chronically low vitamin D levels in infants can cause a condition called rickets, and may inhibit this skull solidification process. Consequently, an infant's entire scalp may feel soft to the touch, according to The Merck Manuals Online Medical Library. Poor or incomplete scalp formation may increase an infant's risk of sustaining a severe skull or brain injury. Insufficient vitamin D levels affect the way in which an infant's bones grow and develop. Infants with rickets may develop unusual bone deformities as symptoms of a vitamin D deficiency. You may notice that your infant's legs appear unusually bowed outwards or that his spine appears crooked or misaligned, MayoClinic.com warns. Your infant's breastbone may also abnormally stick out from his chest. If these symptoms arise, your infants should be evaluated by a pediatrician as soon as possible. If your infant develops rickets due to low vitamin D levels, you may notice that he has difficulty reaching normal developmental milestones. He may have difficulty sitting up on his own or supporting himself while he crawls. The Merck Manuals Online Medical Library explains. You may also observe that his limbs appear swollen due to the presence of abnormally wide bones. Consult a medical professional if your infant experiences any developmental delays, as such symptoms may be signs of alternate medical issues. A vitamin D deficiency may cause muscle weakness or bone pain in infants. If this occurs, you may notice that your infant has difficulty holding his head up on his own or supporting his own body weight while sitting or crawling. Bone pain symptoms may be uncomfortable and may cause his to become frequently fussy or irritable. 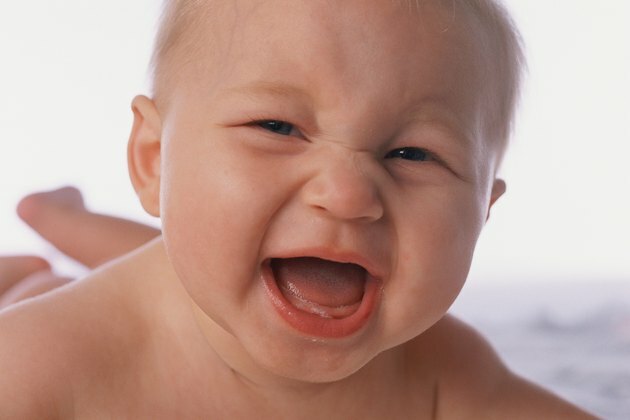 Do Babies Cry Inconsolably When Teething? Are Coconut Oil & Vitamin D Okay for Infants?